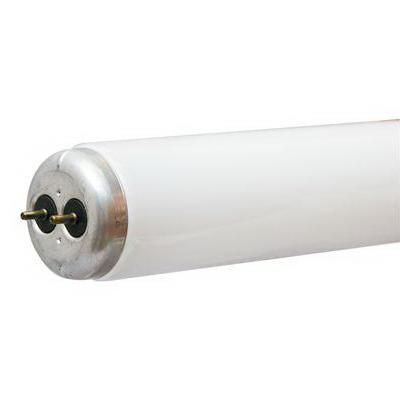 GE Lighting Straight 15-Watt T12 2-Pin G13 medium pin/plug-in base linear fluorescent lamp offers 760 initial Lumens and 685 mean Lumens for bright and crisp light output. It has efficacy of 51 LPW. This preheat lamp regulates the flow of current effectively. It has color rendering index of 60. Lamp with 4100K color temperature rating radiates cool white light to the surrounding. This lamp features sodalime glass bulb construction. It measures 18-Inch x 1.5-Inch Dia. Lamp comes with average life of 9000 hours. It withstands temperature rating of 10 deg C. Lamp is ideal for garage and basement applications.